Pulling great images from an ultra portable small aperture telescope requires powerful image processing tools. After many years of using Unix and Windows based computers for software development, I made the move to the Unix family, Linux on the server side and macOS for my workstation. This choice gives me increased productivity and lower cost of ownership. I found it easy put together a suite of excellent tools for astronomical image processing running on macOS. There is a legacy of good tools running on Windows, these can be run in a Windows virtual machine on macOS. Professional astronomical tools which run on Unix or Linux can be easily recompiled to run natively on macOS. CaptureOne for Sony camera raw format conversion and cropping on macOS and Windows. A capable competitor to Adobe lightroom, a free version is available for Sony camera users. AutoStakkert 3 64 bit by Emil Kraaikamp is a Windows application that delivers outstanding local region optimized stacking. The earlier 32 bit Autostakkert 2 works fine with small video images but could not deal reliably with large camera images. I use a commercially supported version of WINE, CodeWeavers Crossover Mac, to run Autostakkert under macOS which works well. Lynkeos an open source tool that I use for image stacking on macOS. Lynkeos is fast and robust and I use it for image grading and often use it for my final stack. It copes well with large 24 mega-pixel images and UHD 4k video. PixInsight is probably the most powerful tool for processing astrophotography available today. It runs on macOS, Linux, Free BSD, and Windows. With great power comes a steep learning curve. I'm gradually moving my processing to PixInsight as I encounter problems that my easier to use tools can't solve. Photoshop is the go to tool for professional photographers on macOS and Windows. I use it for final adjustments to my images and preparing optimized files for printing. Adobe has chosen not to support the version I have going forward, so I am eagerly evaluating competitive solutions that don't require a lifetime of indentured servitude to use. So far I'm trying Affinity Photo and Pixelmator on macOS. Both can do a reasonable job, but creating and modifying luminosity selection masks isn't as convenient as on Photoshop. GIMP finally has a version out for beta testing that can work with images with 16 bits per channel of data resolution. I prefer to do image capture with a self contained camera to keep the complexity and weight of my setup low. I am now sometimes use a ZWO ASI120MC planetary which requires a computer to frame the image and capture image data. I also have a new Sony camera that supports wireless tethering. This allows group viewing on my iPad or iPhone screen as well as remote image capture. Astro Planner is an excellent observation session planning tool for macOS. 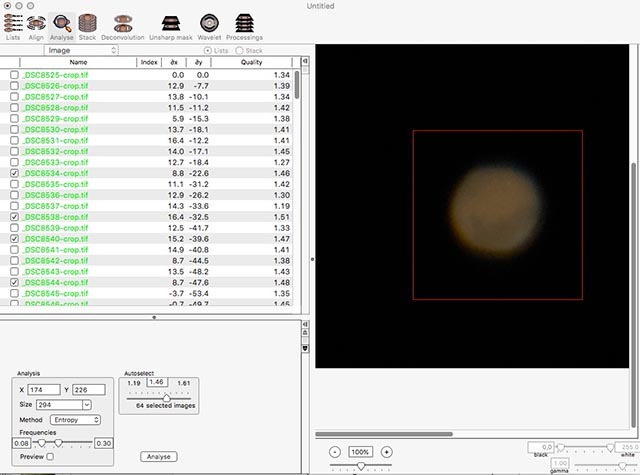 it is easy to export observing lists from Astro Planner to Sky Safari. PhotoPills is a nightscape photographer's ephemeris with everything you need to catch the Sun, Moon, or Milky Way in the perfect landscape context. Available for iOS and Android. Powerful search and virtual reality features make finding the perfect time and location easy. Additional tools help with related exposure, FOV, focus, DOF, and time lapse related calculations. Sky Guide on iOS does an amazing job of presenting a photo-realistic sky backed by a good planetarium database. It is based on Nick Risinger's amazing Photopic Sky Survey. Sky Safari Pro is the best planetarium program that I've found on both macOS and iOS.